In honor of getting back to being more active after a few months of minimal activity, I’m getting back on my board on the days where I feel my strongest. In this blog post I’ll be talking about my favorite places to paddle and kayak to in Miami (and Fort Lauderdale coming soon) along with safety tips & supplies to bring along on your journey! 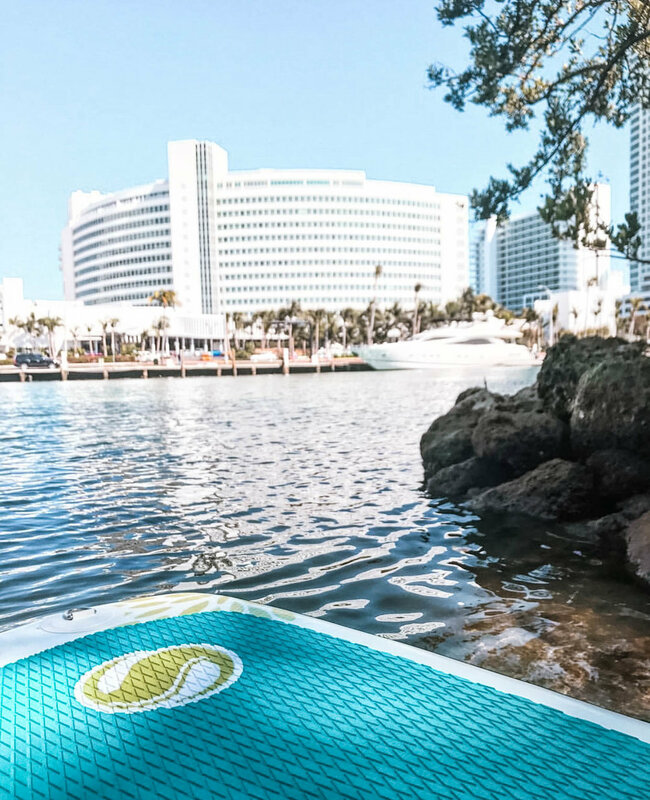 Typically when I take my board out to paddle in Miami, I park at either at Oleta River State Park, Sunset Harbor Yacht Club, Morningside Park or Pine Tree Park. This is the most norther park out of all of the parks that I typically visit while Sunset Harbor is the most southern out of the parks that I frequent. 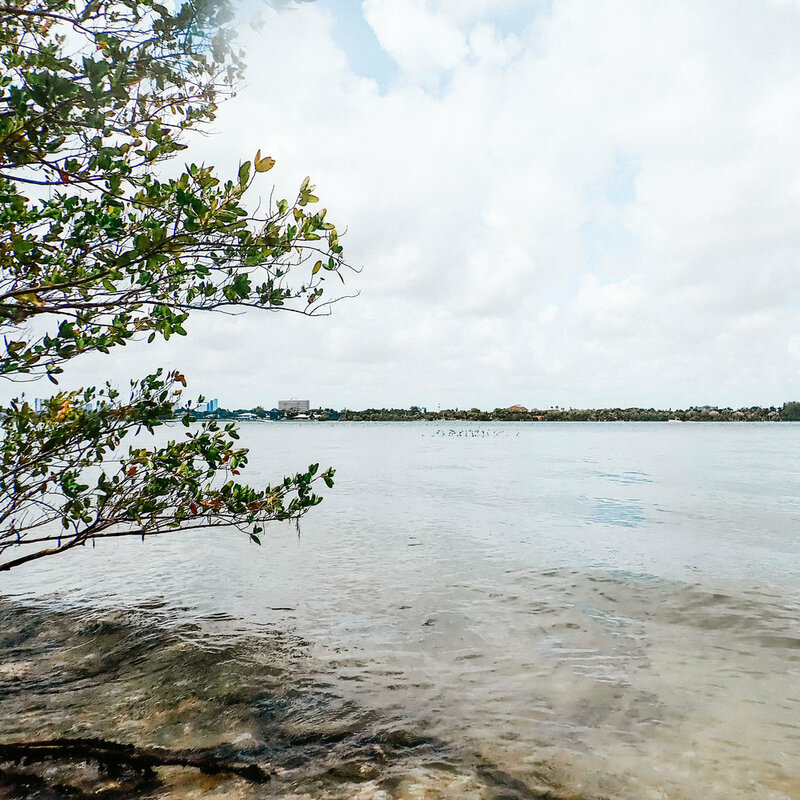 Oleta River State Park is only $6.00 per vehicle and has a large footprint that allows you to paddle to numerous areas including Miami’s popular sandbar, Haulover Sand Bar. I love that you can paddle through the mangroves and park all day for a small fee as well as the opportunity to see a lot of wildlife. The parking at this location is only the $6.00 entry fee while paddle board rentals are the average Miami price for renting which is around $30-$50 however you can find the exact price by visiting each individual website. Note the little dolphin fin in the middle of this photo! Another spot I love to visit is Sunset Harbor to be able to meander through the canals to gawk at some of Miami’s top architectural & residential gems or paddle out towards Flagler Memorial Island. Parking is usually pretty limited at this boat ramp however if you’re renting a board you’re in luck as a parking garage spans Purdy Avenue with numerous paddle board rental companies only a few steps away from the launch. I’ve paddle boarded with both South Beach Kayak as well as TKS Miami. If you choose to turn right at the harbor on your board this will take you down the canals which is a calmer paddling experience while jetting out to Flagler Memorial Island (turning left at the harbor & boat launch) will be stronger tides as well as more boat traffic as you will be crossing the main drag for yachts and smaller boats to commute north to south on the beach. If you’re not a strong paddler or a swimmer, I suggest staying close to the shore of the islands or taking a more relaxed route down one of the canals. Never go out on a board without notifying someone of your trip or without a life vest. In terms of safety, I like to carry a whistle on my board as well as my phone in a dry case. I also use a sup tracker occasionally to track my route. If you’re comfortable with sharing your location (iphone) with someone, it makes for an easier tracking solution if an emergency were to occur! Morningside Park: This park is right smack-dab in the middle of Miami and it’s an absolute gem. It is certainly one of the windier areas to drop your board (or a boat) in as there isn’t much protection in terms of land barriers. You’ll want to be a strong swimmer and paddler if departing from this location. You’ll have to cross the main path for boating traffic however be sure to read below for safety tips when on your board. My favorite island to go to is morningside picnic islands which is directly east of the park. This is an island that has a very narrow shoreline and is often not as saturated with boats much like the other surrounding islands. It’s a perfect place to head out to if you’re on a paddle board or kayak! Fun fact about my addiction to water sports - I’ve been water skiing since I was 5, went to wake boarding camp in the middle of nowhere in Texas as a teen, and have been a deepwater slalom skier for as long as I can remember while being an outdoor water sports obsessed junkie forever. I also traded a juicer for my paddle board…. Pine Tree Park: My last favorite park is Pine Tree Park which is another city-based park that has only a few parking spots and a small boat launch just large enough for a kayak, paddle board, or a small canoe. The parking is free for 3 hours and you’ll need to own your own board if going off from this launch. If your board is on the heavier side, you’ll want to carry a small cart to get your board from the car to the launch. This park is along the Miami River which is a unique view of some of the largest homes in Miami as well as the older condominiums that span the beach. It’s directly in front of Eden Roc and takes you as far south as 1 Hotel due to fallen trees that disrupt getting further southwest through the canals. At the end of this post I’ve linked my favorite products that I take on my board each and every time, especially the ones that help in terms of safety for yourself as well as my favorite gear! Olympus TG-5 Waterproof Camera - I love this camera because you’re able to sinc it with your phone and directly import the photos from camera to phone. It’s also a great camera to do any type of water activity with. I’ve hiked through the jungles and desserts of Mexico, swam with it all through Aruba, and take it on my board each and every time. I highly recommend it! Adjustable Phone Tripod: I use this if I’m trying to take photos or video with more stability. This is great if you paddle to an island and want to take videos with complete stillness. Dry Bag: This is something that is an absolute must, especially when on a paddle board, since they wont have containers like a kayak may. This one isn’t the exact one that I have, however I like that this one that is a backpack dry bag as well. Microfiber Towel: I use this when on my board because it’s extremely small when folded and drys really quickly. Often times I will sit on it if I need a barrier between my bum and my board. Once I get to land I squeeze all of the water out and let it dry, or use it for a towel to sit on! Here’s a few other Smaller Water Bottles (that keep water super cold) to choose from that PLANT TREES with every purchase!! Sun Screen! My favorite brands are linked below. Ice Cube Tray: I don’t exactly bring this on my trips but I do use this with the carafe as regular ice cubes will not fit into the spout. You’ll need to use smaller slender cubes to keep your water cold so this is what I use! Waterproof Phone Case: I use this to protect my phone while adding it to my dry bag. Coast Guard Approved Life Vest: Legally, you need to have one on board with you when out on the water. Don’t risk a struggle with the water if an emergency occurs. Just bring one. Car Inverter: Yes, I like to actually make smoothies from my car. I am in a perpetual state of hunger. This is great to use with a SMALL blender. Check volt needs before purchasing! I use a magic bullet when using this one. It’s great if you’re traveling far to drop your board in and want to have a quick cold snack prior to getting out on the board that you packed for the day! Plant Caddy: I use this to roll my paddle board from my car to boat launches. After having a very severe chest wall injury that prevented me from lifting even a Brita filter, I knew that I needed to adjust how I do things and this is by far the easiest thing to use that is light enough to carry with you on your board. Another bonus is that if you have an inflatable board you can paddle to one destination, deflate and meet up with a friend somewhere else. It will always come in handy, especially when you are controlling how much weight you are lifting! Always carry your cell phone on your board (which means you need to have a water-proof carrying case and a dry bag.) This will allow you to call for help if you were to get stuck on an island or have an emergency on your board. Respect the right of way of boats on the water. If you’re crossing the main drag of large boating traffic with motors, you as a paddler should wait for them to cross as you will take much longer to paddle across the drag vs a yacht. Obviously use your best judgement when making these decisions. If you feel a boat does not see you, a common tip amongst paddlers is to raise your paddle vertically from your board. This allows the driver of the boat to see you. If you’re nervous about boating traffic in Miami be sure to buy a paddle that is brightly colored vs black. If your paddle board is an inflatable one, always bring your pump! Always carry a Coast Guard Approved Life Vest or Personal Flotation Device. If you have two boarders, that means you need TWO vests. Check before purchasing if yours is coast guard approved. Pay attention to WIND, SWELL, SUNSET/SUNRISE, TIDES, & WEATHER. This is extremely important in Miami as weather can change in an instant. Be sure to download apps on your phone that show wind, swell, & tides. Never go out on the water if the winds, swell, or tides are questionable. Never fight nature! Always be sure to check the above before departing on any trip. Pay attention to the angle of your board when large waves are nearby. Angle your board to hit vertically if the waves are extremely big and stop your paddling before they hit. Hold on & let the waves pass before reengaging in your paddling. If you feel you are about to get pummeled by the waves, angle your board accordingly before they hit and lay flat on your board to secure your board as best as you can. (Think about when you were little taking a boogie board into shore. You traveled forward if your board was aligned with the waves.) This will help you stay safe if you hit large waves! Stay close to land if winds, tides, or swell picks up. Always check for your belongings before leaving any island and never leave any remains of any kind. Keep our oceans clean! Don’t pull a Dee and forget your dress on an island that you have to paddle back to for a second time against 14 knot winds!!! Bring sunscreen, a hat (wind-friendly) as well as a cover up of some form! Thank you so much for reading! Please share this post on your social media if you enjoyed it!